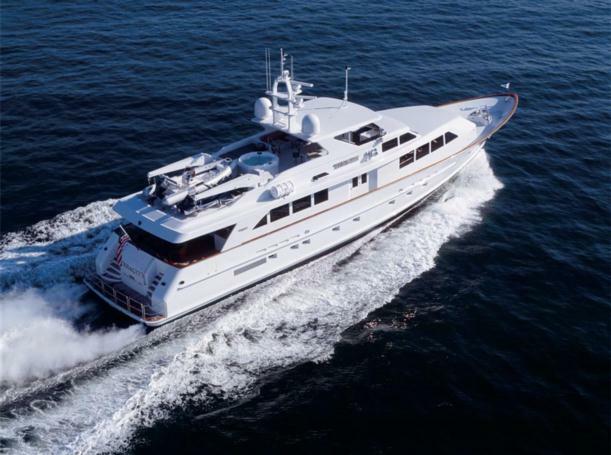 OVERVIEW This 2005 Burger 116′ Raised Pilothouse was built to achieve complete independence while at sea, in complete safety, and in total comfort. Offering four double staterooms for owner and guests amidship on the lower level, there are also generous crew quarters forward with three private cabins and two heads. The Mediterranean styled interior features Makoré (African cherry) and Madrone burl joinery with arched accents, beamed and coffered ceilings, and green-toned marble and granite details. 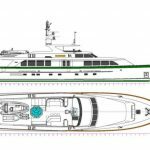 The yacht’s systems are adaptable to European as well as to American standards with shore power management, waste treatment, heating and cooling, as well as worldwide communications systems. 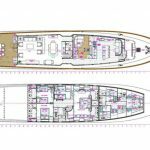 STATEROOM LAYOUT The owner’s accommodations are accessed from the main salon. A Makoré paneled stairway, in a gently curving radius, descends to the lower foyer for access to all four staterooms. In addition to the staterooms a laundry closet is also accessed from the foyer. The MASTER STATEROOM is forward from the foyer through double arched doors. 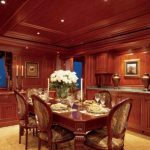 There are his and hers cedar closets aft and built-in bureaus to port and starboard including book shelving and attractive window treatments. 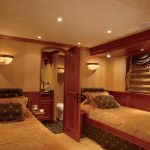 An upholstered settee is to port while the king sized master berth is on highly the centerline featuring an upholstered headboard fronting a raised panel bulkhead. Bedside cabinets are to port and starboard with access to his and hers heads outboard. The heads are furnished with beautiful marble flooring and countertops and custom gold plate fixtures. The two heads are separated by a glass enclosed, oversized shower. The additional three GUEST STATEROOMS include one queen berth cabin and two cabins with twin berths. All are beautifully appointed and feature private heads with showers, cedar closets, and individual temperature controls. As with the master stateroom, all are equipped with independent audio/video systems including access the yacht’s central entertainment system for XM radio, CD, DVD, and satellite TV reception. 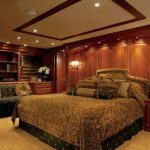 Additionally, all staterooms are furnished with a valuables safe. MAIN DECK The main deck level is surrounded by walkaround side-decks with entry doors to the interior from midship watertight doors to port and starboard and through a single door from the aft deck into the main salon. CREW QUARTERS Forward on the lower level and accessed from the galley/country kitchen area are the crew accommodations. 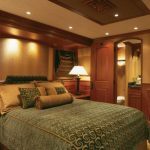 Three double staterooms including a captain’s cabin with queen berth are nicely appointed with Makoré joinerwork and cedar closets. The captain’s cabin has an ensuite head with shower while the other two crew cabins share a head and shower. In addition there is a small crew galley with refrigerator and sink. Each crew cabin is furnished with its own temperature control system as well as with audio/video systems while the captain’s cabin is equipped with monitoring displays for communications, nav, alarm, anchor watch, and security systems. The crew quarters are furnished with a built-in laundry station independent of the owner and guest equipment. AFT DECK The teak planked aft deck is definitely one of the focal points of the yacht for relaxing and al fresco dining. Wing doors are to port and starboard, opening to the side decks while double stairs lead to the integral swim platform aft. A built-in, cushioned bench seat aft faces the high gloss, pedestal mounted teak table forward with additional pull-up seating for up to ten. The wet bar with refrigerator and ice maker are built-in forward on the bulkhead. MAIN SALON Upon entering the main salon from the aft deck the overwhelming sense of elegance is immediately apparent. Surrounded by large, woodwork framed windows, intricately carved crown moldings and valances, the expansive salon is a feast for the eyes both day and night thanks to a variety of lighting options. Plush, upholstered chairs and matching sofa are positioned aft to port, opposite the built-in entertainment center. A carved wood, glass topped cocktail table and matching end tables complete the lounge furnishings. Forward in the salon and separated from the lounge area by a Makore storage credenza is the formal dining area which is further offset from the rest of the salon by its intricate Makore’ paneled overhead. The dining table itself is a beautifully carved period piece with six matching wood and upholstered dining chairs. Two additional matching chairs can be pulled from the elegant game table adjacent to the dining area. Additional storage is provided in a second cabinet outboard to port of the dining table. All table service storage is built with slotted, pullout compartments with locking détentes to insure quiet, secure safekeeping while underway. Built-in along the forward bulkhead is the granite topped bar area with undermounted sink and built-in raised panel cabinet storage for bar glasses and stemware. Refrigerator, ice maker, and wine cooler are concealed behind matching raised panel doors. DAY HEAD To port, forward of the dining area is the smaller of the two midship entry foyers. Inboard of the foyer can be found the nicely appointed day head. Outboard, a water tight passage door opens to the port side deck. Forward from the foyer is an interior door access to the “fan room” beneath the pilothouse. This area provides access to audio/video and communications systems as well as providing a large volume of storage for provisions, equipment, and supplies. ENTRANCE LOBBY Opposite the day head to starboard is the vessel’s formal entry lobby from the starboard side deck. Spacious and well lighted, the lobby leads aft to the dining area and main salon while forward is the galley and informal dining area. Access to the raised pilothouse is adjacent to the formal entry lobby. 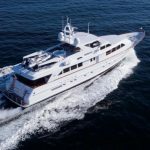 PILOTHOUSE Raised up several steps from the main deck level, the spacious pilothouse provides an excellent view through five canted windshields forward and two large windows to each side. In addition there are additional lower windows to port and starboard for added viewing of the side decks and seaway beyond. The pilothouse is paneled in beautiful Makore’ woodwork and has traditional splined teak flooring. A leather upholstered, L-shaped settee is aft to port while the helmsman is comfortably seated on a leather upholstered, fully adjustable Stidd helm chair. The pilothouse reflects state of the art technology for yacht navigation systems. The “black box” navigation electronics package is extensive, including a night vision camera that can recognize thermal, low light and color imaging. Also included is Burger’s proprietary B.A.S.I.C.S. ship’s system which can monitor a myriad of functions involving security, safety, electrical components, fluid levels, and fuel transfers. Additionally, Burger’s A.M.P.S. system manages generator and shore power functions and provides automatic, seamless transfer between the two. PILOTHOUSE EQUIPMENT Anschutz Pilotstar D-1966 digital Autopilot Anschutz Gyrostar II compass Danforth 6” magnetic compass 2 Furuno FR2117 X-band radars Furuno FA-100 AIS transponder Furuno PG-500 heading sensor Furuno FCV-1200 color LCD Sounder Extron radar video converter 3 flat screen multi-function “glass bridge” monitors 2 Northstar 6000i GPS/WAAS receivers 2 Icom M602 VHF radiotelephones VHF remote on bridge Quantum stabilizer control pad Quantum bow thruster control pad KVH Tracphone Fleet 55 antenna Seatel 24985 TV stabilized antenna Panasonic KX TD816-7 Phone system Wireless Network T-mobile cellular Verizon mobile cellular Valhalla SEA PC computer and monitor Nobeltech chart system Newmar digital voltmeter NVT NightNav NV5100 night vision scope Burger BASICS integrated ship’s information system Elbex CCTV Matrix switcher, 5 camera input B&G Hydra 2000 depth sounder B&G Hydra 2000 wind/speed indicator 2 Carlisle & Finch searchlights 5 Hepworth windshield wipers/washers Caterpillar Engine Vision monitors Stidd helm chair Kahlenberg air horn and whistle controls Directed Electronics disc player DV2602 Teak ships wheel GALLEY/DINING LOUNGE The galley is located just forward of the pilothouse on the main deck and is a chef’s pleasure with granite topped counters and top line appliances. 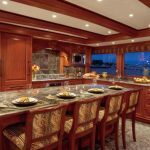 A large granite topped island dominates this area and for informal meals there are four upholstered stools which face the galley work area. Additional seating is forward from the galley at two matching pedestal mounted tables surrounded by a U-shaped plush settee. The beamed overhead of the galley, together with rich paneling including wood faced appliances and raised panel details create an ambience never before encountered in the typical “country kitchen” arrangement. GALLEY APPLIANCES Dacor glass top range Dacor microwave Dacor convection oven Fantech range hood Miele dishwasher Franke S.S. sink KitchenAid disposal KitchenAid trash compactor Grohe faucet fixture Sub-Zero refrigerator Sub-Zero freezer Sub-Zero refrigerator drawers Sub-Zero ice maker Directed Electronics disc player Maytag laundry system – Lower foyer Maytag laundry system – Crew quarters Sub-Zero refrigeratyor – Crew quarters Frigidaire freezer – Crew quarters FLYING BRIDGE / LOUNGE AND BOAT DECK Up five steps from the pilothouse via a sliding waterproof door, the upper deck area is generous and properly designed. Divided into flybridge, lounge, bar, Jacuzzi, cushioned sun deck, and small boat areas, the entire area gleams in Awlgrip Matterhorn white. A green ultraleather helm chair by Stidd faces the center helm destroyer wheel. To port and starboard are built-in companion bench seats with storage below. Full port and starboard wing stations each have controls for engines and bow thruster, etc, plus dual searchlights. Helm and much of the lounge area are sheltered by the special Burger hard top with its multiple built-in lights, speakers, sat domes, and overhead mast with major antenna’s, hailer speakers, and the NVT night scope. An EZ2CY enclosure drops down from the forward edge of the hardtop to the flybridge windshield to keep the area dry in foul weather with zipper openings for ventilation. 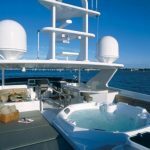 Aft of the helm area to starboard is the full service bar with wet sink, icemaker, refrigerator, and storage. In front of the bar sit four pedestal mounted bar stools while opposite to port is the flybridge dining area two pedestal tables surrounded by a large, U-shaped settee. Next aft is the Jacuzzi with sun pad to port and long bench seat to starboard. Between the bench seat and the Jacuzzi is a walk through passage to the boat deck area with storage for the 18’ Novurania RIB. Port and starboard hydraulic cranes enable launching to either side of the yacht. Mounted in the boat deck area is the EPIRB, life ring and a hatch leading to a ladder down to the aft deck. Life raft canisters are mounted outboard of the flybridge coamings, just forward of the tender cranes. FLYBRIDGE EQUIPMENT Anshutz autopilot controls Anschutz gyro repeater compass Caterpillar engine monitors Flatscreen LED monitor Radar, CCTV, chart plotter NVT night vision monitor Full engine controls Edson 24” S.S. steering wheel Danforth 5” compass Stidd helm chair Port and starboard wing stations with full controls, gears, throttles, jog steering, bow thruster 2 Carlisle & Finch searchlights Controls for Kahlenberg air horns EPIRB Disc player and tuner Panasonic phone set (2) Nautical Structures EZ-3000 hydraulic cranes Wet bar Sub-Zero refrigerator Sub-Zero ice maker Force 10 Grill Baja Hot tub ENGINE ROOM The machinery space is arranged in two separate sections, accessed either from the deck hatch on the aft deck, or from the swim platform through the heavy duty, Freeman reticulating watertight door. From the swim platform, the aft compartment is isolated from the engine room by a watertight partition bulkhead with a second Freeman watertight door. The aft generator is to starboard and is one of two 45Kw Kilopak gen-sets, soft mounted inside of a sound shield and equipped with Sound Down water lift silencers. There is also storage for the stainless swim ladder, air compressor, and tool storage. Access to the starboard rudderpost and steering tie bar assembly is clear. To port of the aft generator is a workshop area complete with a rugged workbench fitted with a vise and stainless steel sink. The area houses, among other items, the main electrical distribution panel, the sewage treatment system, components of the Atlas shore power management system, and the aft shore power cord reel. The CO2 tanks are mounted in this compartment along with the dive compressor and storage racks for dive tanks. The main engine room is forward, through a watertight Freeman door set into an athwartship watertight bulkhead. On centerline are additional components to the Atlas system and the other 45Kw Kilopak gen set enclosed in a sound shield. The engine room layout is logically arranged, with tags on all valves and pumps. The stainless steel piping and valves for the fuel management system, oil change system, and hydraulic system give witness to the quality of engineering throughout. Approximate speed and range as follows: 2000 rpms at 70% load produces 15kts, fuel burn of 100gph and range of 1,440 miles 1600 rpms at 55% load produces 12.5kts, fuel burn of 50gph and range of 2,200+ miles Tankage Fuel: 9,948 US Gallons in three tanks, #1-4,012 gl; #2-4,081 gl; #3-1,985 gl (day tank and overflow) Water:1,485 US Gallons Watermaker output: 1,500 US Gallons/day Waste tanks: Black: 395 US Gallons Grey: 400 US Gallons Lube Oil: 160 US Gallons Used Oil: 160 US Gallons Sludge tank: 74 US Gallons Engine Room and Misc. Equipment Extended warranty on twin Caterpillar engines to Sept. 2012 Quantum central hydraulic system Quantum stabilizers – QC 1000×2 w/ARC 3000 Quantum bow thruster – QT60 Jastram Steering system w/ 2hp HPU & 24V aux. back-up Tides Marine Strongseal dripless stuffing boxes Soundown flexible coupling systems Soundown dual stage lift mufflers DeAngelo exhaust piping and bracket system Jun Air 2000 air compressor (208V) 25′ heavy duty air hose with air connections fore, aft, and flybridge Delta T Automated Ventilation Control System w/port and starboard 208V vent fans and fan guards Allen Bradley 208V exhaust fan – lazarette Head Hunter head systems Head Hunter grey and black water transfer pumps Black and gray water waste tanks with pump out systems and Headhunter tank gauges Hamman waste treatment system Little Giant condensate pump Flow Max manifold bilge pump system (8) Rule auxiliary bilge pumps with float switches Kidde/Fenwal CO2 fire protection system – auto/manual Ansul hand held fire extinguishers throughout Stainless steel fuel piping Swagelok stainless steel hydraulic fittings and ball valves Kaydon fuel purification system Fuel overfill alarm system Electric and manual fuel transfer systems Tuthill Fill-Rite fuel transfer meter Yamada lube oil transfer system Teel rotary hand pump Lube Oil transfer and change system Hart fuel and fresh water tank gauges Mechanical gauges in engine room Port and starboard raw water sea chests Matrix S-1500 water maker Pulse Water Care water softener Aft compartment 110V bait freezer (2) Everlast EV-45LB hot water heaters (2) Davey fresh water pumps Bell and Gossett hot water circulating pump MarineAir/Dometic Chilled water air conditioning – 216,000 btu w/3 stage VFD system 30 kw electric heat integrated into HVAC system Engine block heaters Elbex closed circuit vessel monitor system – 5 cameras Entry alarm system Michigan Wheel 5-blade propellers 46×43 Flybridge wing controls 3 trumpet Kahlenberg air horns with auto-timer for fog signal running Kahlenberg air whistle Central Vac system Clark dive compressor Wilton work bench vise Snap-on tool box Kohler work room sink ELECTRICAL SYSTEM 120/208 VAC, three phase, four wire system, 60 HZ. 208V for electric motors and pumps single phase, 120V for lighting and small appliances. Two 45 KW Kilopak generators, at 1800 rpm, 4 shore connections, 208V three phase, 100 amp AC systems, Smart-Y adapter and 50 KVA Atlas all-power converter. Glendenning Cablemaster shore cable system in forward cuddy. Sonnenschein gel type batteries for engines, generators, and house systems. 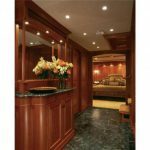 Automatic 24V emergency lighting in passageways and main areas. Inland and international navigation lights. Internal telephone/intercom 12 stations, includes hailer, SatCom, and doorbell. Alarm system for bilge, fuel, water, gray and black water, generators, main engines, reverse gears and intrusion. Audio, video antenna distribution system. Lightning suppressor. Closed circuit television from aft deck and engine room. Electrical Equipment AtlasShore Power Classic – AC power management system 50 kVA Atlas Smart Box Atlas Seamless Transfer System Two 45kw Kilopak generators – John Deere 4.5L 1,800 rpm power plants Sound shields for both generators Two 100amp, three phase 75′ shore power lines Glendenning Cablemasters with 100’ shore power lines fore & aft Two 50′ 100amp secondary power lines (2) Pompanette shore power connector boxes with hatch covers Wards 480VAC 200 amp Galvanic Isolator Simpson Electro Catalytic corrosion monitor 12V(2) & 24V DC Sentry automatic battery chargers 5 DC battery banks as follows: 2 engine 24V/196AH banks 1 generator 196AH bank 1 house 196AH bank 1 electronics 110AH bank for nav. and comm. Systems Newmar digital volt meter monitors all 5 banks Burger B.A.S.I.C.S. system monitors all 5 banks UPS APC 980W for telephone system UPS Powerware 2000VA for ship’s nav systems Ship’s Lighting system 120V AC 24V bunk lights, indirect galley lighting, stairway lighting 24V locker lights, heads, pilothouse, exterior, cuddy, and chain locker Electric engine heaters Shore cord adapters for domestic and international applications Panasonic Hybrid Integrated phone system – 2 land lines, cell line, sat phone line, intercom Fleet 55 Mini-M Sat-phone system 12 phone sets throughout SeaTel tracking gyro TV antenna system Wireless Network Fireball Music (MP3) database (10) independent Direct TV receivers Electric door bell with port, starboard and aft connections Exterior Deck Features The two 4500 pound pull Maxwell heavy duty anchor windlasses serve port and starboard anchors in stainless steel pockets, foot switch operated and also operated by a hand held remote with 50’ cable. Chain washes are internal. A stainless steel cutwater protects the stem. Splash rails and rub rails are stainless capped full length, above the waterline. The high bulwarks provide a dry foredeck and the clean sweep of the sheer is topped by the massive varnished teak Burger trademark cap rail, protected outboard by solid stainless steel half oval. Foredeck storage is forward in the superstructure with step-in access doors to port and starboard. Glendenning Cablemaster 100’ shore cord accessed from the bow. 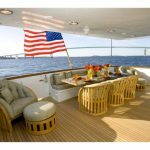 Bulwark doors for dockside access are located amidship and at the aft deck on both sides of the yacht. Tide Ride Boarding steps fit at any door. Dockline handling on the stern is assisted by port and starboard warping windlasses on the corners of the aft deck. A powerful bow thruster facilitates docking or handling in tight situations. Aft deck access to the swim platform is to port and starboard via integral stairs. The starboard stairs conceal the Passarelle garage which opens to deploy the fully hydraulic gangway capable of extending 15’ straight out or angled from the trailing edge of the swim platform. Deck Equipment Nautical Structures hydraulic crane (2) Model EZ 3000 18’ Novurania 550DL RIB tender 115’ Yamaha outboard (2) Switlik 10 person life rafts in canisters, hydrostatic releases, EPIRB’s & SART’s 18 PFD’s (3) Life rings Strobe MOB(Man Over Board) light 406 MHZ EPIRBS Kahlenberg 3 trumpet T-3H air horns w/ 116 amp whistle Kahlenberg ship’s bell and bracket Nautical Structures hydraulic stern passarelle Maxwell VC 3500 aft deck electric powered 24V capstans(2) Maxwell VWC 4500 anchor hydraulic powered windlasses(2) Port and Starboard anchors in pockets, ½” chain rode Dual 120 kg Davis Marine Poole “N” type anchors Dual 300’ ½” ACCO G40 hot galv chain rodes P & S chain stops and band brakes Anchor chain internal washdown system Marquipt 7 step tide ride boarding stairs w/double teak rails, and 2 step extension option Integral swim platform with stainless steel safety hoop rails Underwater lighting system Stainless steel swim ladder Swim platform mooring whips Hot & cold water Scandvik shower – swim platform Freeman watertight lazarette door Freeman watertight flybridge door Freeman watertight side doors Flybridge wet bar: Sub Zero icemaker, refrigerator, Scandvik sink Corian bar and table tops, flybridge Crown bar stools and table pedestals, flybridge Stainless steel Force 10 gas grill, flybridge Baja Sports hot tub Stidd helm chair, one at Pilothouse, one at flying bridge 5 Hepworth pilothouse windshield wipers w/ washers Aft deck bench seat with cushions, cover and storage below Murray custom aft deck teak 3 section table with cover Crown table pedestal Aft deck furniture – 5 chairs Aft deck wet bar, Sub Zero fridge & ice maker Frigidaire freezer Corian bar top Port and starboard boarding gates – 2 on each side Stainless steel cleats (10) 15″ Stainless steel hawse pipes Starboard & port teak wing doors Hot & cold water faucets in cuddy (forward lazarette) Phone, cable TV, & compressed air connectors in cuddy Shore power circuit breakers in cuddy Dockside water connectors fore and aft Deck hatch to crew quarters Steps up PH windshield mullions for cleaning Fenders and lines Teak cap rails Covers for all exposed equipment including windlasses, searchlights, pilothouse windows, all exterior seating, flybridge console and seating, and the flybridge area in its entirety. Construction Aluminum hull and superstructure with four watertight transverse bulkheads. Internal hull framing is both longitudinal and athwartship. For sound reduction, bulkheads are isolated from the hull shell plating with insulation from the waterline up. Additionally, all mechanical equipment is isolation mounted. A double bulkhead separates the mechanical rooms from the stateroom section of the yacht. Engine room overhead insulation is minimally 4”. Mufflers, motor mounts, shaft couplings, HVAC, and water making systems are all engineered for maximum life and minimal noise generation. Particular attention is given to the exterior Awlgrip to ensure its long life. Rub rails are protected from scuffing by the application of a heavy duty strip of high polished stainless steel, countersink fastened to the solid rails. Windows, doors, lighting fixtures, and hardware are isolated from the structure to create a seamless paint system. Thanks to Burger’s careful attention to detail, along with the commitment of the present owners and their crew, TENACITY today looks as good as she did when she was launched in 2005. Hull form has a sharp entry with a rounded bow bottom form tapering to a vee bottom with molded chines continuing all the way aft to the transom and a constant deadrise of 17 degrees. The overall directional stability of this hull is phenomenal with or without the use of stabilizers.